Scientific distinction, sufficient to be offered a full professor position at UCLA. Scientific and mathematical interests and vision, and the ability to interact with a wide range of researchers and research topics. Experience and capability to manage IPAM, including programs, staff, finances and administration. Ability to reach out to a broad range of constituents, including the mathematics and science communities, the National Science Foundation, and the public, as well as the ability to engage in fundraising. A commitment to diversity in math and related disciplines, especially the participation of women and under-represented minorities in research. IPAM is centrally located on the UCLA campus and occupies its own building, designed by Frank Gehry. 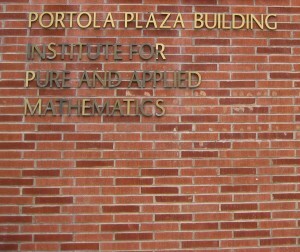 UCLA is home to some of the most important mathematical scientists of this era. The Southern California region is highly dynamic and includes top 20 departments in virtually every scientific subject. Candidates should apply online at https://recruit.apo.ucla.edu/apply/JPF01891 where they will also upload their CV and personal statements. Applications will receive fullest consideration if received by June 1, 2016. The search will remain open until the position is filled. Please contact ipam@ucla.edu for any questions. Search Committee: William Duke and Al Hales, Co-Chairs, Russ Caflisch, Ingrid Daubechies, Sallie Keller, Dave Levermore, Juan Meza.